The spellbinding premiere of The Weir at the Royal Court in 1997 was the first of many works to bring Conor McPherson to the attention of the theatre-going public. Acclaimed plays followed, including Shining City, The Seafarer, The Night Alive and Girl from the North Country, garnering international acclaim and being regularly produced around the globe. McPherson has also had significant successes as a theatre director, film director and screenwriter, most notably with his award-winning screenplay for I Went Down. 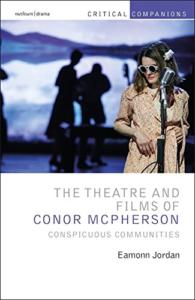 This companion offers a vibrant, detailed and engaging critical analysis of the plays and films of Conor McPherson. It considers issues of gender and class disparity, violence and wealth in the cultural and political contexts in which the work is written and performed, as well as the inclusion of song, sound, the supernatural, religious and pagan festive sensibilities through which initial genre perceptions are nudged elsewhere, towards the unconscious and ineffable. Supplemented by a number of contributed critical and performance perspectives, including an interview with Conor McPherson, this is a book to be read by theatre audiences, performance-makers and students who wish to explore, contextualise and situate McPherson’s provocative, exquisite and generation-defining writings and performances. Come on Over: The Third Narrator? I Went Down: On the Road to Nowhere?